You built a Locost? That’s cute. Kent Finnerty built one, too–inside his parents’ living room. The high-school student formed the chassis in three main sections–front, middle and rear–so he could carry it through the doorways in his home. He built the body from high-density polyethylene, then swapped in the mid-mounted drivetrain from his previous Challenge entry, a turbo Plymouth Laser. The shock absorbers came from Honda sport bikes. And no, Kent didn’t alienate his family by turning the house into a workshop. In fact, we think we spotted his mom watching and beaming from the sidelines. That's pretty sweet! Very cool build. Nice, here's a Challenge car I hadn't heard of before. I wonder if he kept it modular after being fully assembled, being able to fit through a regular doorway seems like it could be a useful capability for a car...it would make it relatively easy to ship in crates for one thing. The bodywork looks good for how simple and cheap it is, with a couple more pieces over the rear it could've looked like a cheap KTM X-bow. I'd forgotten about this. Wasn't it around 05 or something, I know there was an article in the magazine back then. Any more pics of the chassis and suspension out there. 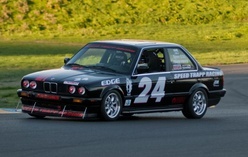 What happened to the 'racecar' class where things like this and the GRM Formula Vee competed. Would this still be challenge legal?